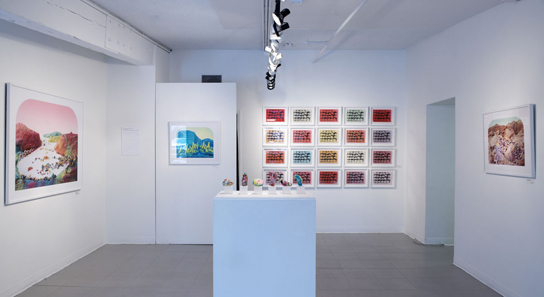 Processed Views is an ongoing, multi-part project investigating the state of our food systems – from industrial food production to the fast food values that our nation has voraciously embraced. 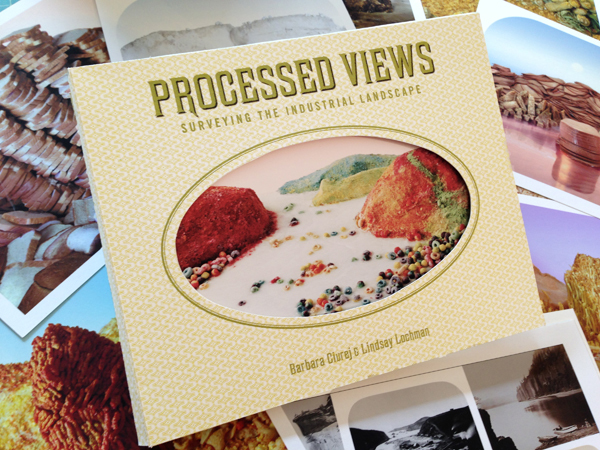 Processed Views: Surveying the Industrial Landscape interprets the frontier of industrial food production: the seductive and alarming intersection of nature and technology. As we move further away from the sources of our food, we head into uncharted territory replete with unintended consequences for the environment and for our health. 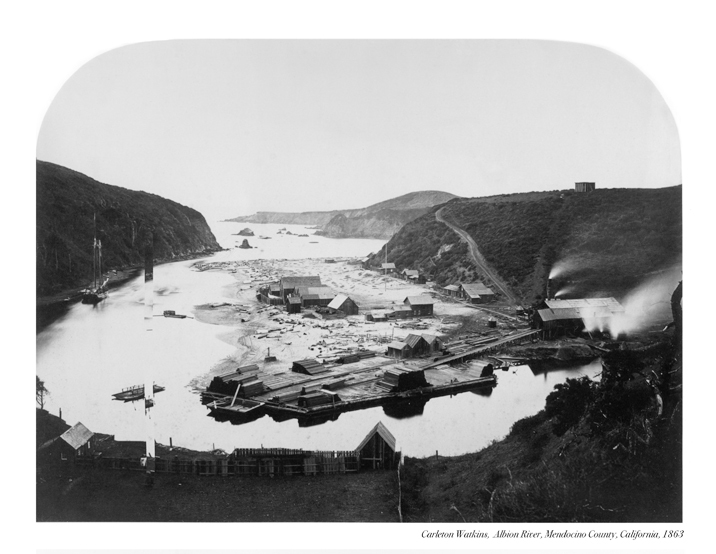 at left: Fruit Loops Landscape, 2012 and at right: Carleton Watkins, Albion River, 1863, Visit BOOKS to purchase the Postcard set. Enhanced Varieties is a suite of Jell-O®-toned silver gelatin prints reproducing Carleton Watkins’ 1889 photograph, Lake George Cling Peaches. In a world of industrial foods devoid of season, colors and flavors are created, enhanced and presented as improvements on nature. Enhanced Varieties, prints of peaches toned in various flavors of Jell-O, mirror the human-made varieties that beckon us from our supermarket shelves. Watkins’ photograph of a crate of peaches, which we reproduce here, illustrates lushness overshadowing the true costs of cultivation when labor is cheap and water is scarce. Land barons began advertising in the 1880s, encouraging easterners to invest and settle in southern California. Carleton Watkins, renowned for capturing the sublime in nature, was hired to depict the economic opportunities of the region. Despite a desert climate heavily dependent on irrigation, southern California was marketed as a land of inexhaustible agricultural potential. Farmers flocked to this region and with the help of agricultural technology, grew a new reality – America’s fruit basket. Today we have come to expect year round availabilty, low prices, variety and ready supply. We offer this selection of Peaches as a reflection of technology's imprint on nature through engineering and marketing. 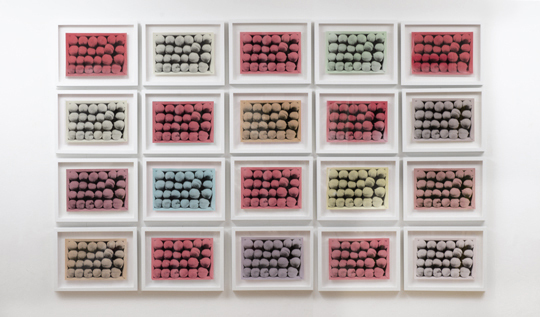 Jell-O® toned silver gelatin prints from the series Enhanced Varieties, 2015. 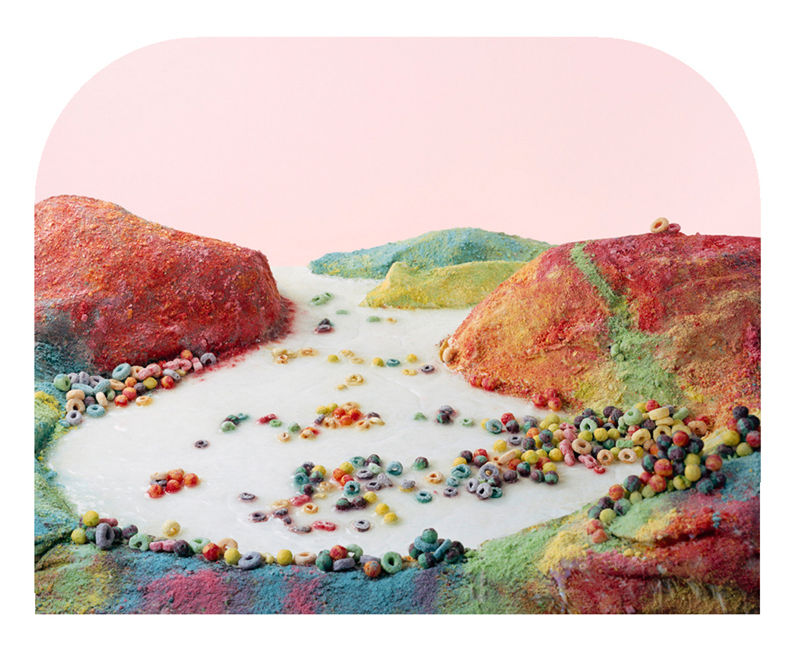 Sugar Geologies are small sculptures composed of candy – hypothetical specimens excavated during the Sucrose Period – expressing earth shaping forces such as compression, crustal deformation, deposition of sediment. Set of 10 postcards in a diecut case. See Books to order. Twitter FEED is a compilation of tweets excerpted from the Twitter account of a rogue White House Senior Advisor (@RogueSNRadvisor). As reported by an alleged White House insider, these excerpts chronicle President Trump’s fast food binges in response to the stresses of the office and the maelstrom of controversy he has created. It is a reflection of the "junk in, junk out" nature of this president's tenure. 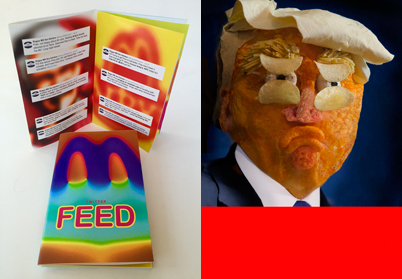 The Tweets are reproduced on bright, bloated logos from the fast food giants of America. Accompanied by a postcard featuring a junk food portrait of Donald Trump. Ingredients list included on back.